The National Consortium for the Study of Terrorism and Responses to Terrorism (START) featured distinguished terrorism scholar Jyoti Belur at its March 6 Research Roundtable. During her presentation, Belur discussed what India's Prime Minister Manmohan Singh calls "the biggest internal security challenge ever faced by our country"?the Maoist-inspired Naxalite insurgency. Since 2004, India has seen a dramatic climb in Naxalite-related violence. "Nearly 1,200 people were killed in 2010 alone," Belur said. And with Naxal activity affecting more than 182 districts in 13 states, Indian government and police officials are searching for a lasting solution to left-wing extremism. However, Belur explained, there has been very little research conducted on how police fight Naxal violence. 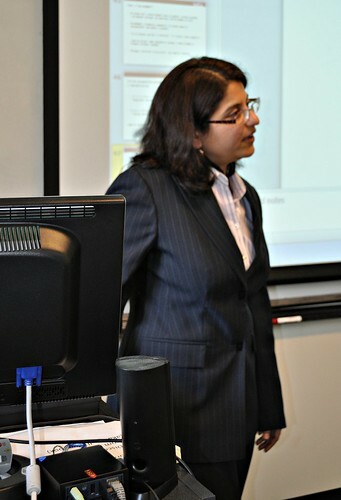 "The police are at the forefront of the conflict between the state and Naxal rebels," she explained, "and this project illuminates police perception of how counter-terrorism strategies and policies are communicated across IPA hierarchy, how police discretion affects application of counterterrorism strategies and the effect of police actions on the community." Police perspectives are palpably different across states facing similar conflict. Low-ranking officers have very little understanding of strategic policing and policy issues involved. Ownership of the problem by local police is the key to success. Central paramilitary forces should ideally only play a supporting role to local police. A carrot-and-stick policy will bring success?strong police action accompanied by a viable surrender policy. Success is heavily dependent on community support. Developmental efforts have to work in tandem with policing efforts. Only effective police leadership and a supportive political environment can engineer and sustain necessary organizational changes. "My hope is to gain a better understanding of why certain counterterrorism policies appear to work in specific contexts, but not others," Belur said, "and thus provide IPA and state officials with a framework for designing successful policing and counterterrorism policies." Belur is a research associate at the Jill Dando Institute of Crime Research at University College London, U.K. After obtaining a master's degree in economics from the University of Mumbai, she joined the Indian Police Service and served as a senior police officer in the North of India for several years. While undergoing police training, she completed her second master's degree in police management at Osmania University. Belur also holds a third master's degree in human rights from the University of Essex, as well as a doctorate degree from the London School of Economics.